Harry (10), Jacob (11), Jack (12) and Caz (??) 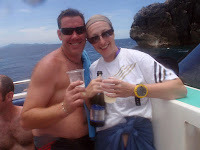 yesterday finished the the 2 day PADI Scuba Diver Course by completing their Open Water Dives in Koh Tao. All four worked until late in the evening the day before to learn the theory, having completed the 3 Confined Water Dives earlier in the day. They were all fantastic during their Open Water dives and made sure they did everything Instructor Claire had taught them. Although sometime's quite difficult, but not on this course, it's always great to teach kids to dive and to see them enjoy what the underwater world has to offer. Hopefully they will continue with their diving adventures as they get older and help spread the word about what a great time they had learning to dive, and be the new generation of divers to help protect the underwater environment. As a pat on the back: The father of 2 of the boys commented today on how lucky they felt to have had Claire as their Instructor and how fantastic they thought she was with the kids - great job Claire. 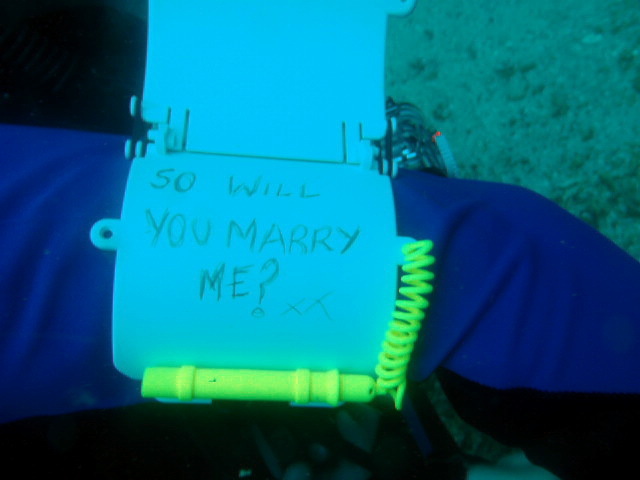 The Dive Academy would like to congratulate Phil & Amanda on their recent engagement and were privileged to be part of the Proposal. Phil contacted us a couple of weeks before his arrival detailing his romantic plan to propose to Amanda underwater and left us to organise the minor details. We are happy to say everything went according to plan and despite a slight shortage of air at the crucial moment, Phil managed to pop the important question, pre-written on his arm slate. After an emphatic "Yes" from Amanda, as if by magic Phil produced the ring from inside his BCD pocket and the proposal was complete with a very happy outcome. Congratulations guys and all the best. Hope to see you and dive with you again. 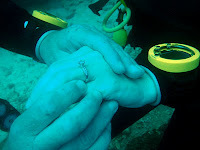 Any thoughts about an Underwater Wedding?? ?